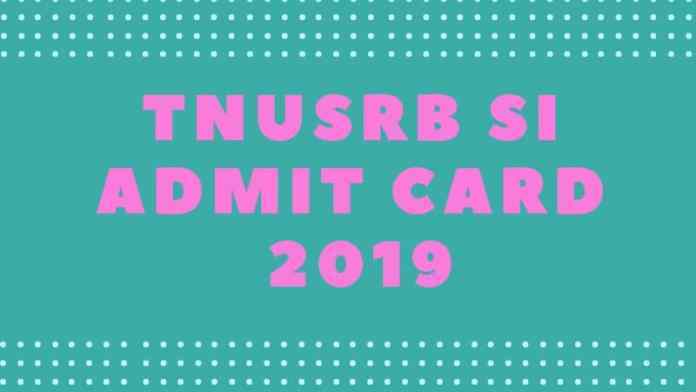 TNUSRB SI Admit Card 2019 – Tamil Nadu Uniformed Services Recruitment Board (TNUSRB) will release the TNUSRB SI Admit Card. The admit card will be released on the official website i.e. tnusrbonline.org. At first, admit card for the preliminary examination will be released. As of now, the board has not announced the prelims examination date. For downloading the TNUSRB SI Admit Card 2019 candidates have to provide login credentials on the login page. For each stage of the examination separate admit card will be released. For Open and Departmental Quota separate examination will be conducted. From this page, candidates will get full information regarding TNUSRB SI Admit Card 2019. The candidates can only use online mode for downloading the TNUSRB SI Admit Card. Admit Card will be not sent by post or email. For more information regarding TNUSRB SI Admit Card 2019 check the schedule given below. After ending the process of the application form, admit card for prelims examination will be released. The cand. The candidates who will fill the online form on time for those only admit card will be issued. Candidates can follow the steps given below for downloading the admit card. For Open and Departmental Quota separate examination separate admit card will be released. How To Download TNUSRB SI Admit Card 2019? For downloading the admit card candidates can follow the steps given below. After downloading the admit card candidates should take the print out of it for future reference. After filling the login credentials hit the enter button. Thereafter admit card page will open on the screen. Click on the download option for downloading the TNUSRB SI Admit Card 2019. From below candidates can check the details which will be mentioned on the admit card. It will be mandatory for all the candidates to carry a hard copy of the admit card on the day of the TNUSRB SI 2019 Examination. What To Carry On The Day Of TNUSRB SI 2019 Exam? Candidates must carry the below mentioned documents on the day of the examination because if the candidates will not the documents mentioned below on the examination day those will be not allowed to appear for the examination. The candidates who will qualify the written examination by scoring minimum qualifying marks those will be shortlisted. Among the shortlisted candidates, only 5 times of vacancy candidates will be called for the PMT, ET, PET, and Document Verification and for those only admit card for PMT will be issued. The admit card will be released on the official website. Candidates can check the admit card downloading steps from above. For Open and Departmental Quota separate PMT examination separate admit card will be issued. From below candidates can check the Physical Measurement Test (PMT) / Endurance Test (ET) / Physical Efficiency Test (PET) details. The candidates who will qualify the PMT, ET, PET, and Document Verification exam will be shortlisted. Among them the candidates in a 1: 2 ratio of the vacancy will be shortlisted for viva voce and for those only call letter for viva voce will be issued. The admit card will be released on the TNUSRB admit card. From below check the details of TNUSRB SI 2019 Viva Voce Round. Viva Voce 10 marks. In this examination presence of mind, vocabulary of the candidates will be tested. 10 marks In this examination presence of mind, vocabulary of the candidates will be tested.